The husky warbling song of the Blue Grosbeak is a common sound in summer around thickets and hedgerows in the southern states. Often the bird hides in those thickets; sometimes it perches up in the open, looking like an overgrown Indigo Bunting, flicking and spreading its tail in a nervous action. This brown woodpecker flashes bright colors under the wings and tail when it flies. Its ringing calls and short bursts of drumming can be heard in spring almost throughout North America. Two very different-looking forms -- Yellow-shafted Flicker in the east and north, and Red-shafted Flicker in the west -- were once considered separate species. A typical summer sight is a male American Goldfinch flying over a meadow, flashing golden in the sun, calling perchickory as it bounds up and down in flight. In winter, when males and females alike are colored in subtler brown, flocks of goldfinches congregate in weedy fields and at feeders, making musical and plaintive calls. Adaptable, colorful, and cheery-voiced, House Finches are common from coast to coast today, familiar visitors to backyard feeders. Native to the Southwest, they are recent arrivals in the East. This bird's famous song, with its varied repetitions and artful imitations, is heard all day during nesting season (and often all night as well). Very common in towns and cities, especially in southern areas, the Mockingbird often seeks insects on open lawns. The powder-blue male Mountain Bluebird is among the most beautiful birds of the West. Living in more open terrain than the other two bluebirds, this species may nest in holes in cliffs or dirt banks when tree hollows are not available. Regarded by falconers and biologists alike as one of the noblest and most spectacular of all birds of prey. Although it is found on six continents, the Peregrine is uncommon in most areas; it was seriously endangered in the mid-20th century because of the effects of DDT and other persistent pesticides. This is the most widespread and familiar large hawk in North America, bulky and broad-winged, designed for effortless soaring. An inhabitant of open country, it is commonly seen perched on roadside poles or sailing over fields and woods. The Robin's rich caroling is among the earliest bird songs heard at dawn in spring and summer, often beginning just before first light. In fall and winter, robins may gather by the hundreds in roaming flocks, concentrating at sources of food. Steller's Jay is most numerous in dense coniferous woods of the mountains and the northwest coast, where its dark colors blend in well in the shadows. Except when nesting it lives in flocks, and the birds will often fly across a clearing one at a time, in single file, giving their low shook-shook calls as they swoop up to perch in a tall pine. Western Tanagers nest in coniferous forests of the north and the high mountains, but during migration they may show up in any habitat, including grassland and desert; the bright males often draw attention by pausing in suburban yards in late spring. 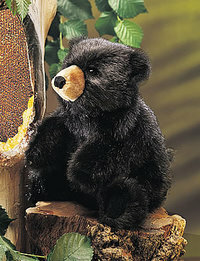 Give a big bear hug to this cuddly stuffed black bear! With a thick coat of black fur and soft brown pads on his feet and muzzle, this cute 12-inch stuffed bear brings a sense of wild adventure to playtime. Smooshy and sweet, this is one wildly wonderful bobcat. With soft, spotted fur, true-to-life tufted ears and signature bobbed tail, this stuffed animal makes a fierce and fine feline friend. Plush Mule Deer Doe 12"
Our mule deer doe stuffed animal is highly detailed and complete with large mule-like ears that make it easy to distinguish from other deer. Super soft and perfect for cuddling. Cuddlesome perfection, that's what this darling, feather-like fur porcupine is. Sweet and embraceable, this adorable stuffed animal is sure to become their all-time favorite. 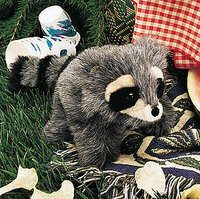 Our ringtail cat stuffed animal is part of our exclusive line of Cuddlekins ultra-plush wildlife toys. Specially designed to look like real the thing while still being incredibly soft and irresistibly squeezable. Every Cuddlekins plush is made with—and for—love. Turkey vultures are typically known for their scavenging, but this fluffy friend is better known for his cuddly qualities. With floppy wings, wild hair and a bright orange face, this turkey vulture Cuddlekin is a cuter version of the buzzards you’d find in nature.